Comet prices from £5150 inc vat. The original Comet, fast and exciting for club racing but with its roomy uncluttered cockpit and optional Mino Rig can be ideal for beginners and lightweights. Having been built for twenty five years, there are large fleets at many clubs and the active Class Association organises plenty of Comet races each year. Renowned as a deceptively fast dinghy in light winds, the decent sail area and light hull ensure an exciting ride in a breeze! At only 50kg hull weight and using a two-piece mast, the Comet will easily cartop. Built in GRP in a wide range of colour schemes a standard Comet is ready to sail and has top quality fittings with powerful rig controls led aft. An extensive options list includes race rigging kits with ball-bearing blocks and Dyneema control lines as well as covers and launching trolleys. Although the standard sail is easily reefed, the Comet Mino uses a shorter bottom mast and smaller rig, making it ideal for juniors as light as 6 stone. When they get older, gaining weight and experience, the dinghy can easily be upgraded to the full rig at a very modest cost. The Comet Mino has also found a keen following amongst the more mature sailor, providing thrills without so many spills! 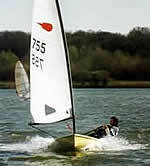 New exciting variation of the Comet uses a 6 sq m Mylar Sail on a 570mm shorter mast. The sail has battens and a zipper on a sleeve luff allowing the sail to be raised on a halyard. The shorter mast and smaller but more efficient sail make the Xtra easier for lighter crews. As the overall performance of the new Xtra is expected to be very similar to a conventional Comet, Xtras can now race alongside Comets at Open Meetings. A centre mainsheet is now available as an option on all the singlehander Comets. Please check our New White Xtra Sail (pdf). Contact us for brochures and price lists.